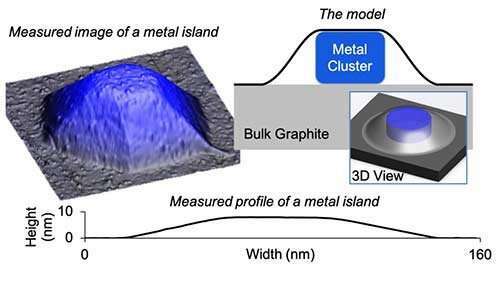 In a collaboration between the U.S. Department of Energy's Ames Laboratory and Northeastern University, scientists have developed a model for predicting the shape of metal nanocrystals or "islands" sandwiched between or below two-dimensional (2-D) materials such as graphene. The advance moves 2-D quantum materials a step closer to applications in electronics. Ames Laboratory scientist are experts in 2-D materials, and recently discovered a first-of-its-kind copper and graphite combination, produced by depositing copper on ion-bombarded graphite at high temperature and in an ultra-high vacuum environment. This produced a distribution of copper islands, embedded under an ultra-thin "blanket" consisting of a few layers of graphene. The research is further discussed in the paper "Squeezed Nanocrystals: Equilibrium Configuration of Metal Clusters Embedded Beneath the Surface of a Layered Material," published in Nanoscale.